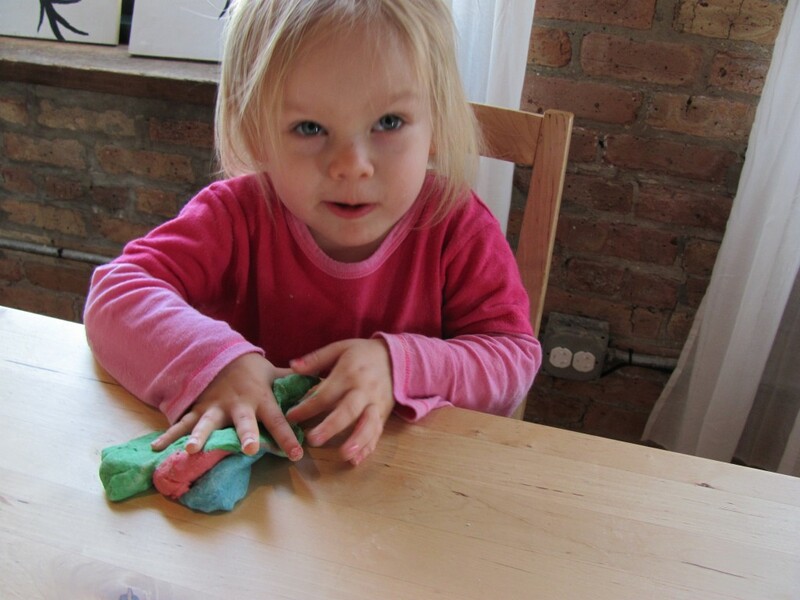 The other day, Ava and I decided to make our own play dough. 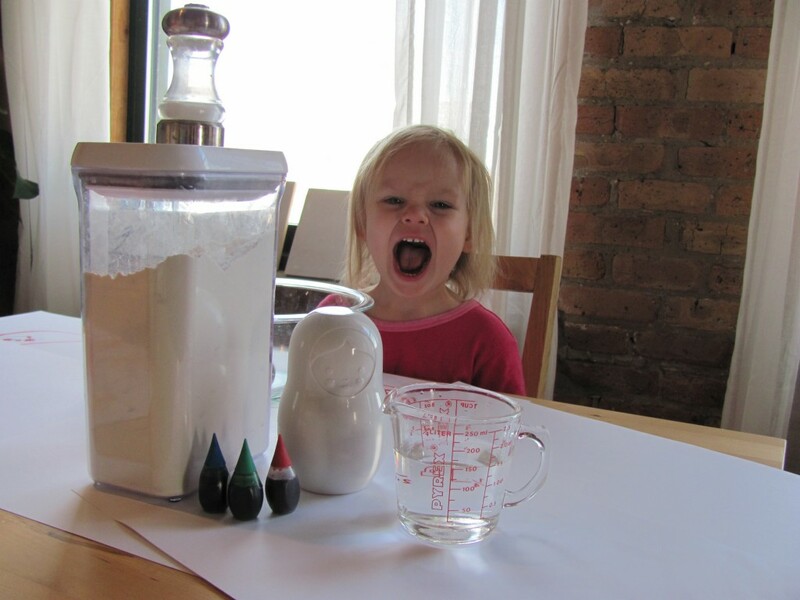 I found a no-cook recipe on instructables, gathered the ingredients [flour, salt, water, food coloring], and sat down at the table with a very excited little girl! 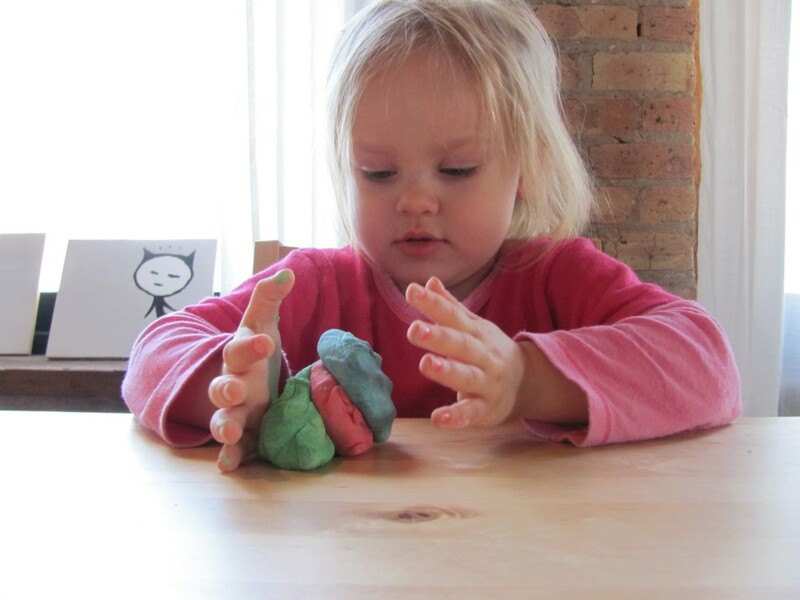 I covered the table with some scrap paper and handed her the measured ingredients to dump into the bowl. 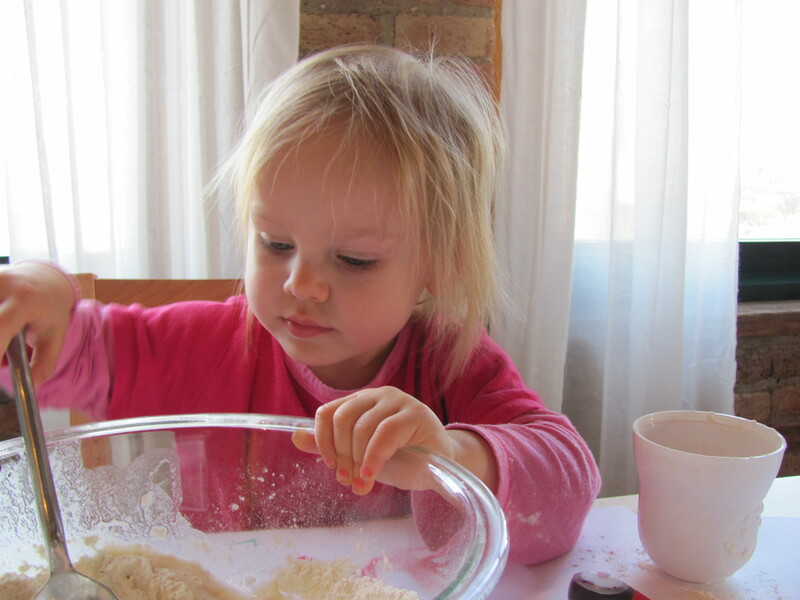 Then I gave her the spoon and let her mix it up – her most favorite part of helping me in the kitchen. Once the dough was thoroughly mixed, I divided it into three lumps [I had to keep adding flour until the dough wasn’t so sticky] and then added the food coloring. [I would really recommend wearing disposable gloves for this part, unless you want red, blue, and green hands like I ended up having.] 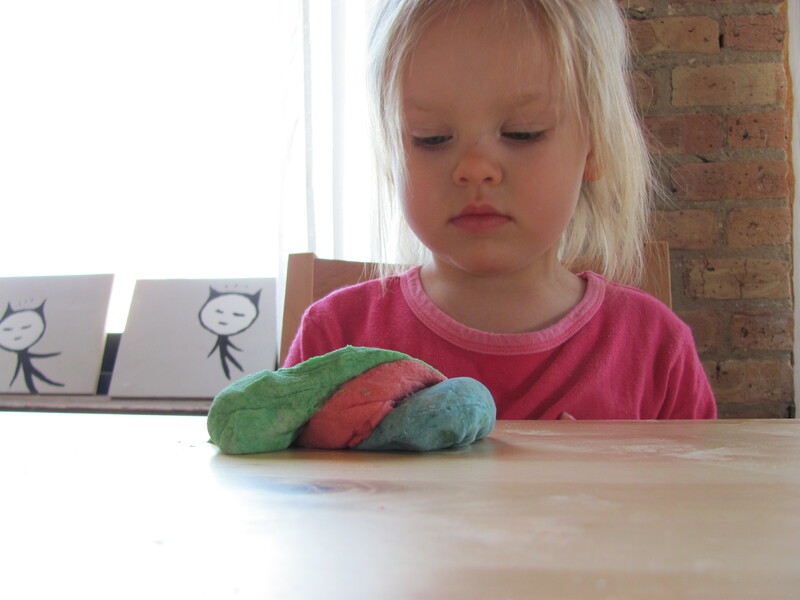 Just keep kneading the dough until the color is blended. After I just reminded her to NOT smash it all together. 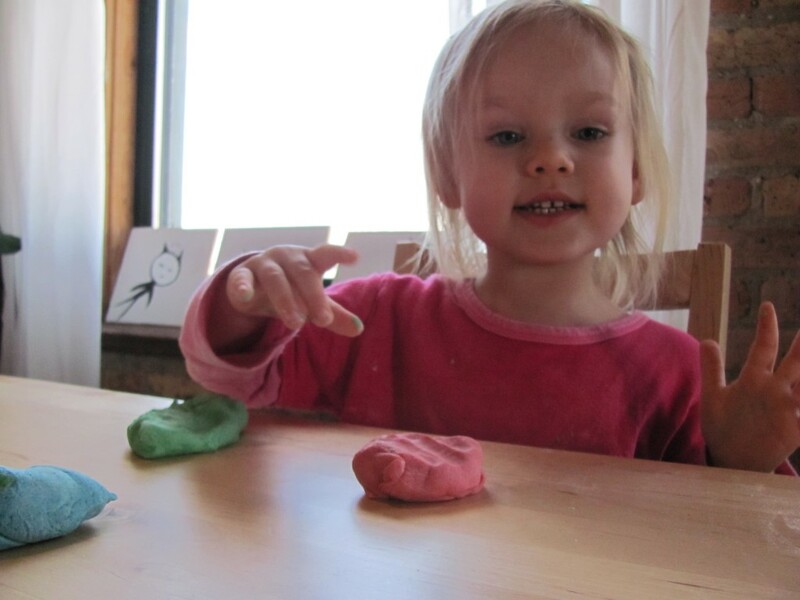 After I reminded her that once you smash them together, it’s very unlikely to have three separate colors again. 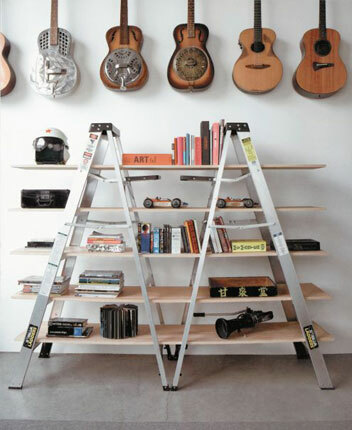 Loving these ladder shelves [um, and the guitar collection – especially the steel – killer]. 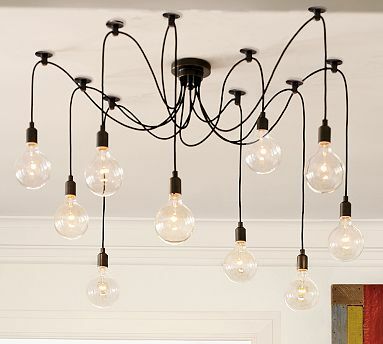 Great for an industrial touch. 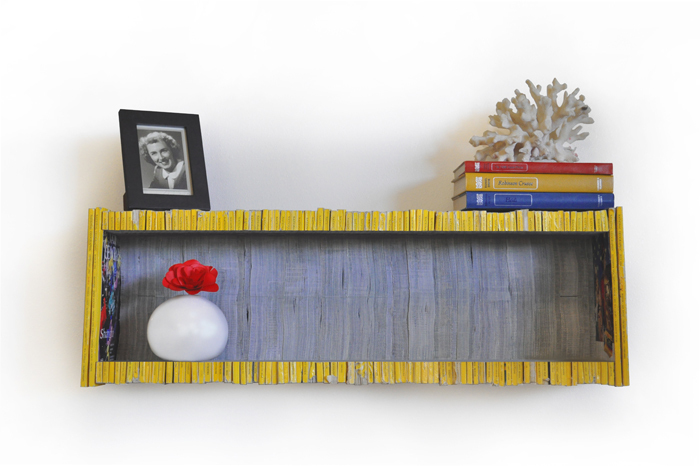 A shelf made out of magazines? 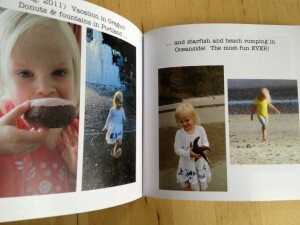 Yep – National Geographics. Pretty darn awesome. 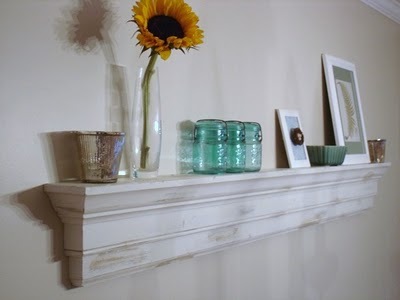 Don’t have a fireplace mantle? 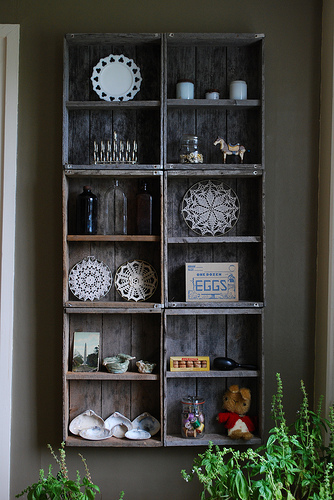 Make one and use it as a shelf. If you’re not very wood shop friendly, scour craigslist and salvage shops that carry architectural items for an old mantle to use. 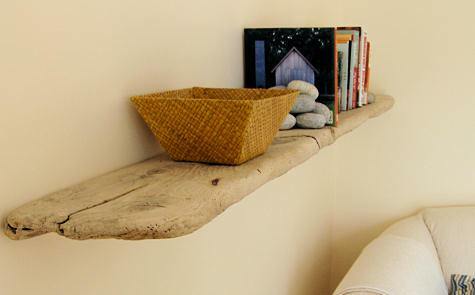 Super rustic … I love bringing natural elements into the home and this driftwood shelf does it perfectly. Bringing new meaning to the word bookshelf. 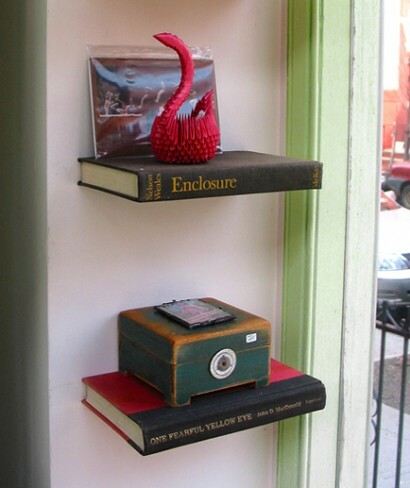 These shelves ARE books! 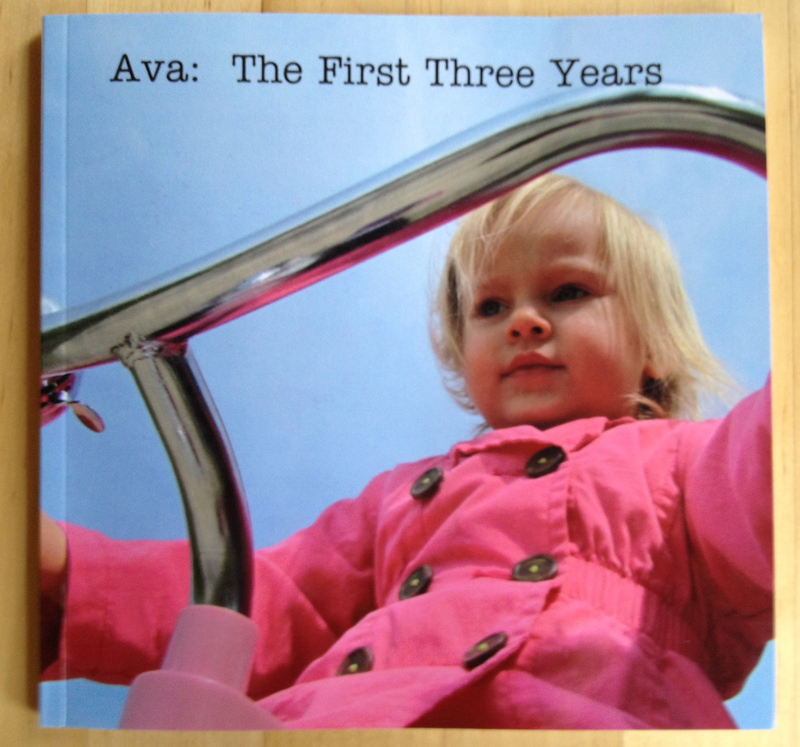 You can choose from a selection of titles too. 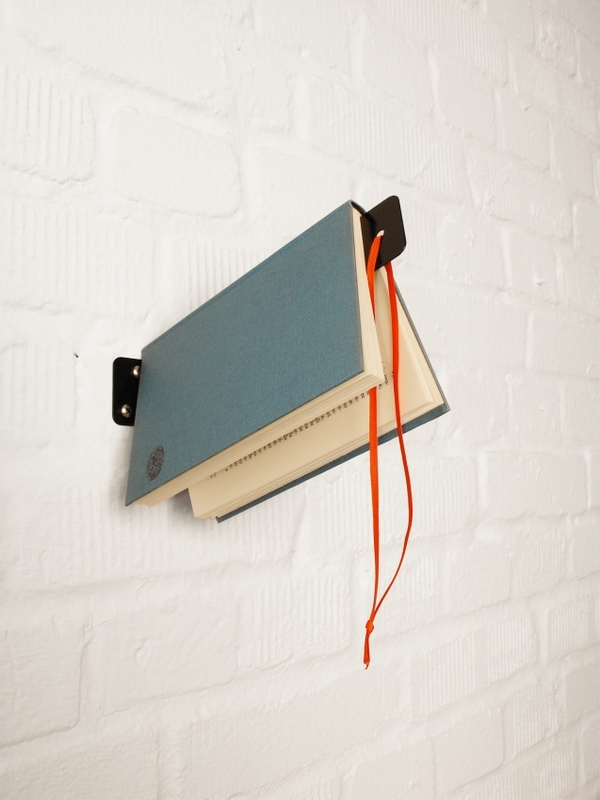 I spotted this mod book hanger over at sfgirlbybay. They come in black, orange and white and also function as a bookmark. Give thanks to the ºes design label for this genius. Who knew that mushrooms made such great display shelves? The DIY is a little involved, but well worth it. Will someone please make some for me???? 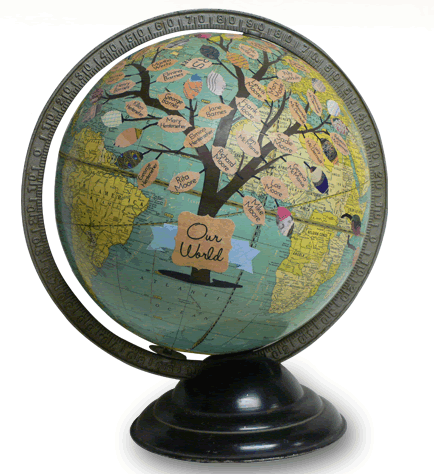 Today’s post is inspired by these beautiful collage globes by Artist, Wendy Gold. Aren’t they just to die for? 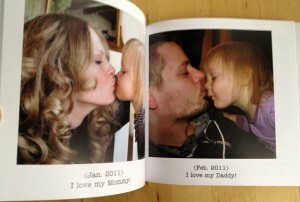 The one shown below can be personalized to showcase your very own family tree. Super cool. 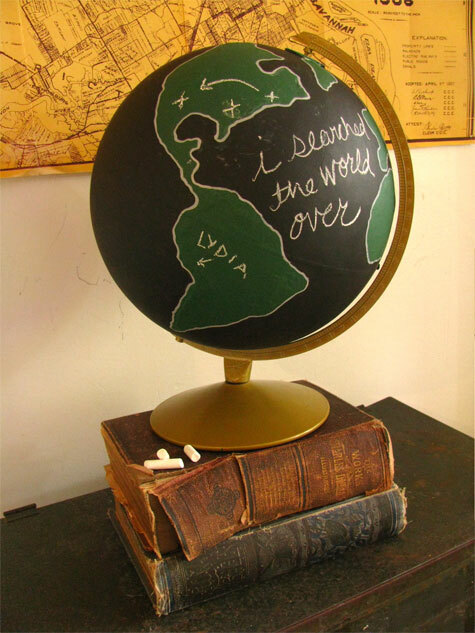 This chalkboard globe made by Halligan Norris for Design*Sponge looks amazing and is fairly simple to make. 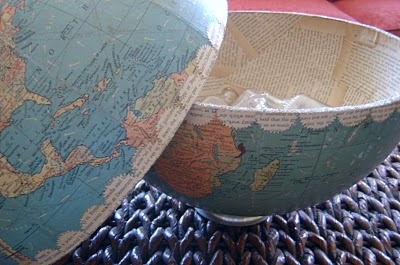 This global bowl made by Cathe of JustSomethingIMade was made by sawing a globe in half, and lining with old book pages and some glitter – pretty neat idea [and it makes one for you, one to give away!]. 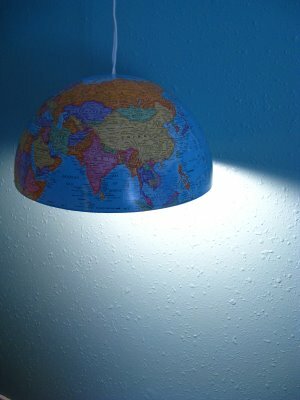 Get the tutorial for this cool Globe Pendant lamp from Project Create a Home. I think I would add some metal hardware on the top, but otherwise genius. 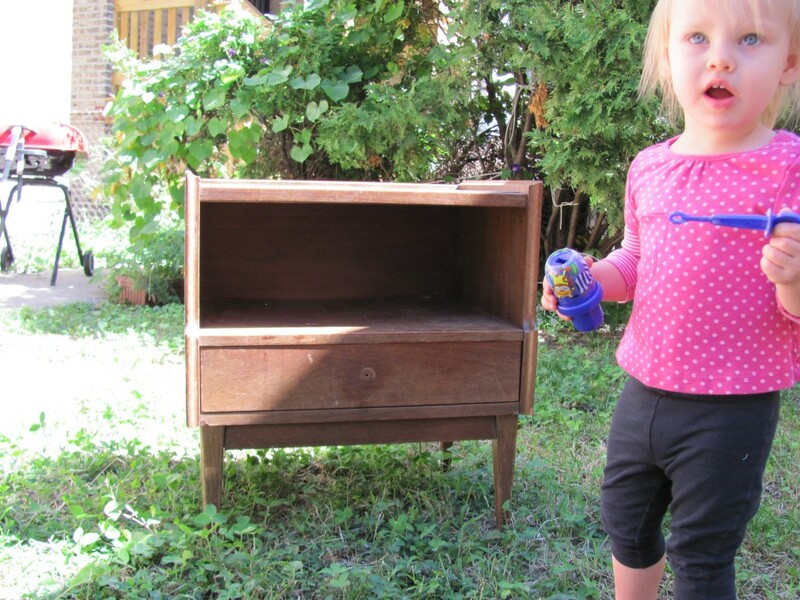 Sometime in September we found this beat up old nightstand in the alley. I was immediately drawn to it’s shape and could see right past all the dirt and dings. It started a mini obsession rehabbing old wooden furniture and spray painting anything I could get my hands on [bedroom dresser DIY coming soon]. The ONLY thing I miss about our old apartment uptown was that it had a small yard and big basement I could use for this kind of stuff. Anyway, all I used was some medium and fine grit sandpaper, gloves, black spray paint [mine was a high gloss], and a new knob. Easily less than $20 in supplies. And no more than 1-2 hours of labor. First I scrubbed it clean, sanded out the imperfections with the medium grit paper, wiped it down, went over some spots with the fine grit, wiped it down again, and then I busted out the spray paint. Omigosh I love spray painting … even if I did have to drive 10 extra miles to a Home Depot outside the Chicago city limits to get it. You can buy one of those spray paint holster things to save you some finger cramps, but this was a pretty small job, so it wasn’t really necessary. I find using a slow and steady back and forth motion with the can works best. Don’t get carried away. Light even layers. Make sure each layer is dry before you do the next to prevent drips and bubbles. After the paint dried, I screwed in the new knob and one month later we moved our “new” little nightstand into our new loft. Saved from the trash, and now a bedroom treasure. My family loves wreaths. 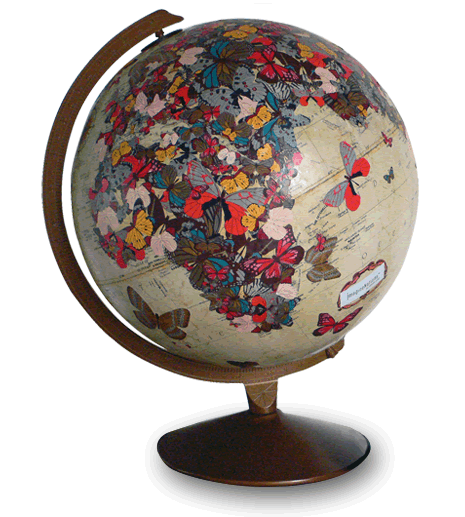 They are usually stuffed full of fake flowers or wrapped with red, white, and blue ribbon. Ick. I finally found some wreaths that are too pretty to hang on the porch … I’d put any of these beauties on my wall anytime of the year. All of these picks are fairly easy to make, just click on their tutorials for more info! Black and White Stripes: Made from an old sweater[!] by Mandi. Tutorial on Smile and Weave [towards the bottom]. Moss: I love almost anything green. This moss wreath is so simple and pretty. Made by Christina of Our Little Box. Cupcake Wreath [amazing, right?! ]: Made by Jen from Tatertots and Jello. Cupcake liners, ribbon, and hot glue – I think even I could pull this one off! 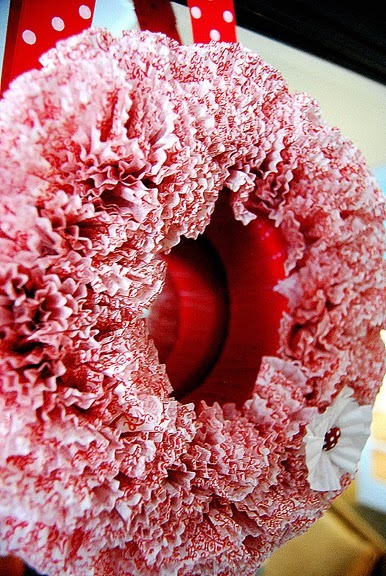 She made it for Valentine’s Day, but depending on what cupcake liners you get the possibilities are endless. 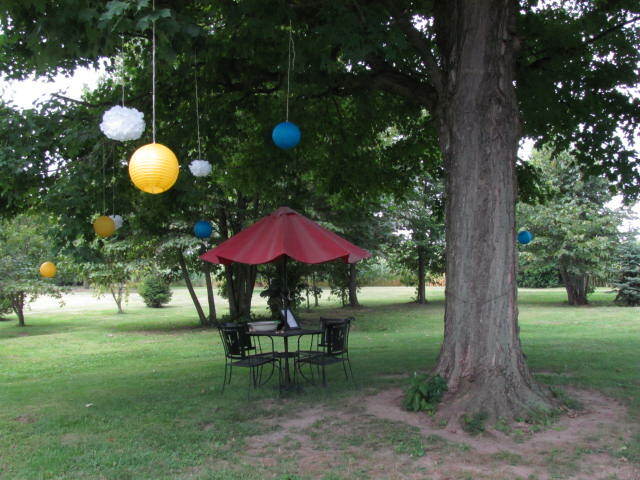 Balloons: What a cute idea – perfect for a birthday! Made by Erin of Two More Seconds. 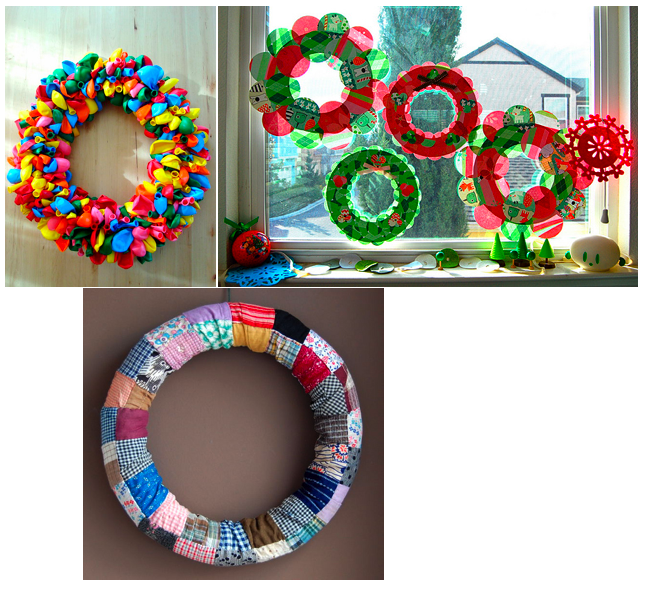 Paper Circles: A fun project to do with kids … very Christmas-y! Made by Beckie of Movies of Myself. Patchwork: I love patchwork quilts and this wreath looks just as homey and cozy. By Jennifer Casa, of JCasa *handmade. Yarn: Those little felt flowers really make this wreath. So pretty. Made by Danielle of Take Heart. Bicycle: Very inventive. No tutorial, but pretty simple – wrap ribbon and lights around an old bike tire. Love it. Made by Megan. Clothespins: I am beginning to realize that you can make a wreath of out almost anything. This cool clothespin wreath was made by Denise of d. Sharp Journal. 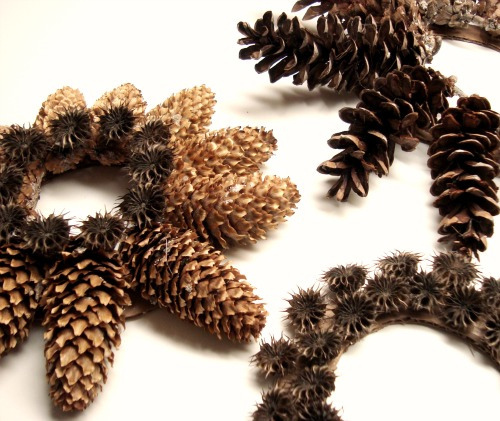 Nature: This one would be really fun to do with the kids – have them run around collecting pine cones and pods, then they can make their very own designs. You could even bring out the spray paint for some pops of color. Made by Maya of Maya*Made. In our old apartment, I had most of my jewelry in vintage boxes and my necklaces hung from two large hooks on the bathroom wall. Since we moved, it’s all still in a box because I haven’t figured out how I want to organize it yet. I started looking around for some good ideas and thought I would share some of the best. 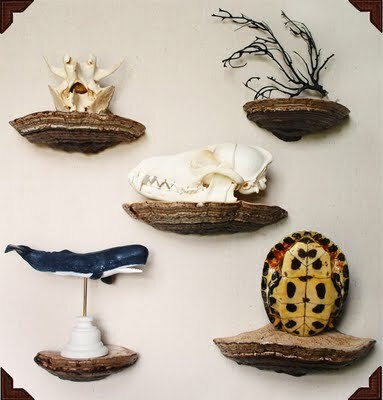 Lori from Paisley Wallpaper stores her jewelry in these cute little molds. 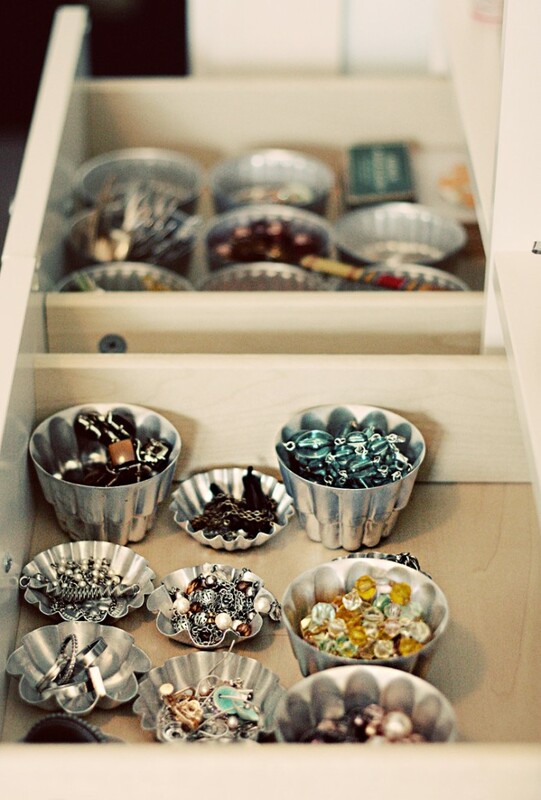 Great idea if you have the drawer space! 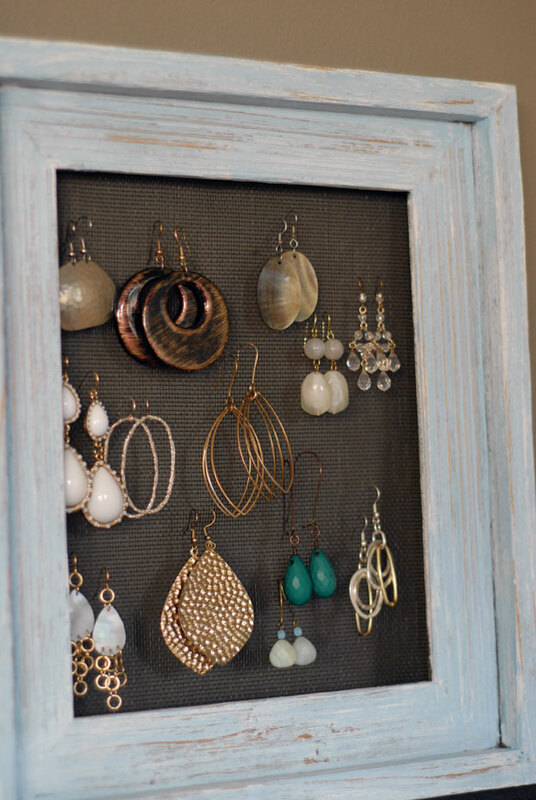 I love the way an old frame and a piece of screen were used for an earring display. 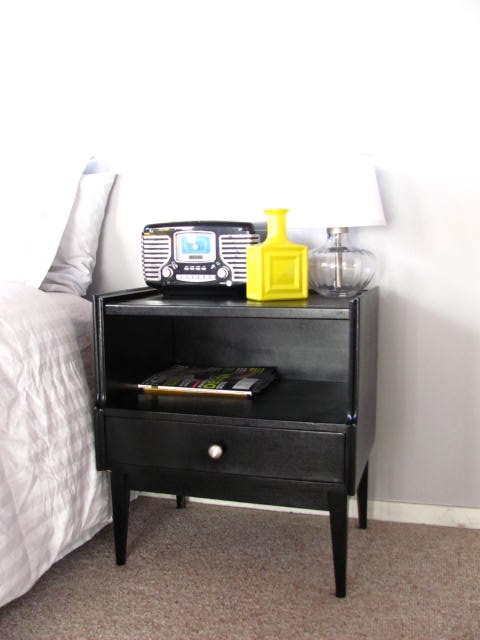 Check out the full tutorial at Restored Style [she also has some other great jewelry storage ideas, so be sure to look around]. 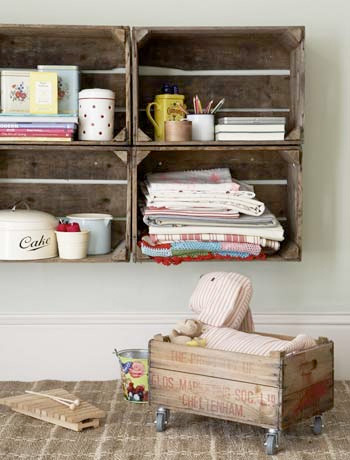 Or if DIY is not your thing, you can buy one that someone else made by hand. 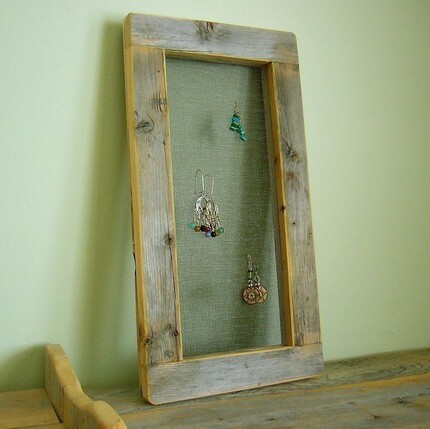 This earring frame was built from weathered barn wood by Paradise Hill Designs. 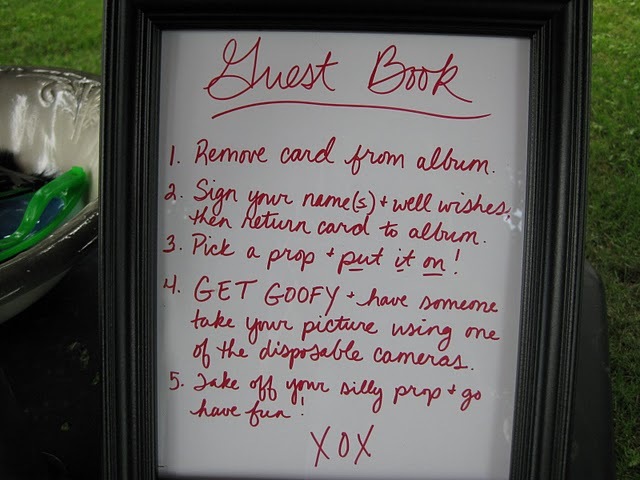 We wanted to do something fun for our guest book, rather than just have people sign their names. I wanted to look back and laugh. I purchased a leather photo album with two picture slots per page and cut out different colors of card stock to fit in the bottom slots [for people to sign]. The top slot will be for photos. We sat a few disposable cameras on the table, markers, a bunch of silly props, and some instructions. 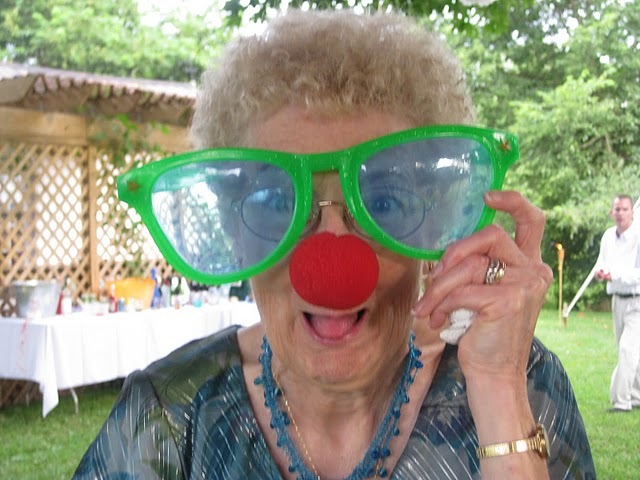 I cannot wait to get the film developed because I know we are going to have some great shots … like this one of my Gramma Dorie! Priceless. 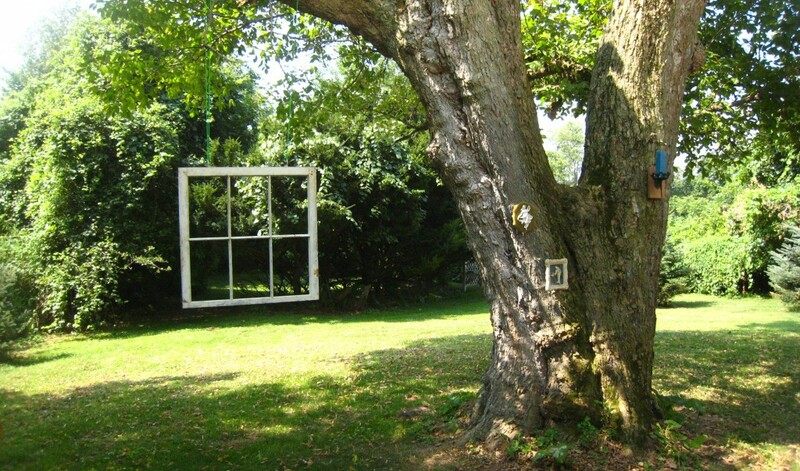 I had found some old barn windows down in the barn [imagine that] and immediately knew I wanted to hang them from tree branches for the wedding. In the end, I could only hang one [well, my Uncle Don and Mike did all the hanging] because the tree branches were higher than I thought and impossible to reach even with our ladder. We removed the few panes left in the window [they looked pretty cool, but were loose and I didn’t want to risk someone slicing themselves on broken glass at the wedding], inserted a couple of eye hooks in the top of the frame, strung it with some clothesline and wrapped that around the branch. 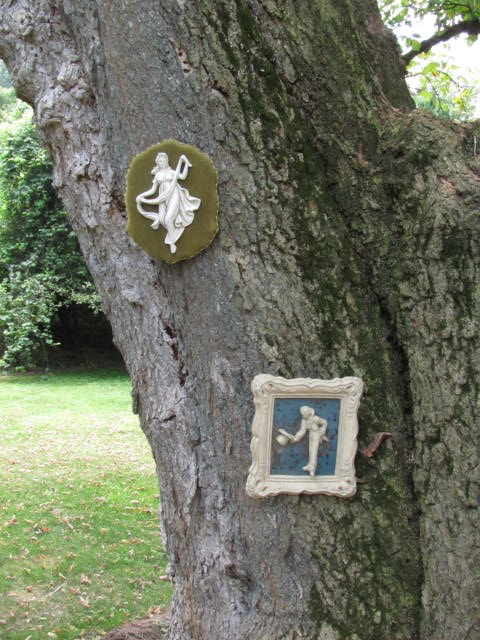 I also hung a few vintage pieces I found in thrift shops on the tree along with an iron candle holder left by the original house owners in the basement. 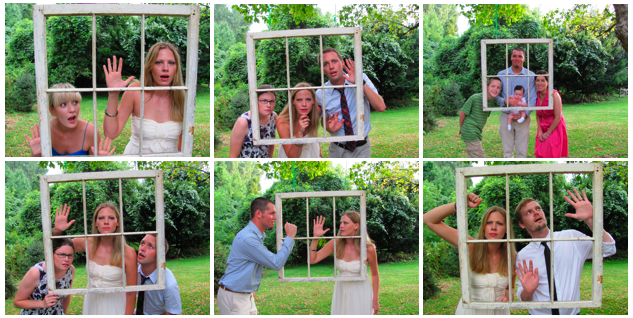 I was quite pleased with the outcome and everyone [namely myself] had a lot of fun taking snapshots in the window panes. Simple and pretty. 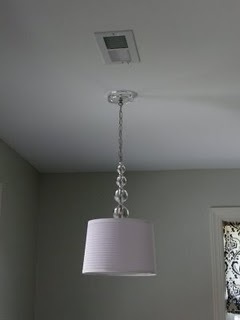 Lately I have been seeing some pretty cool chandeliers that [if I had time and were the least bit crafty] I could make myself. Since I’m probably not going to, I thought you might. If you do, send me some pics! 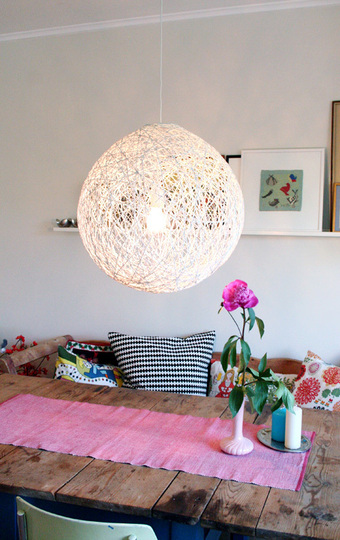 This Bubble Yarn Lampshade by Pickles was featured on re-nest and is actually something I might try to make. 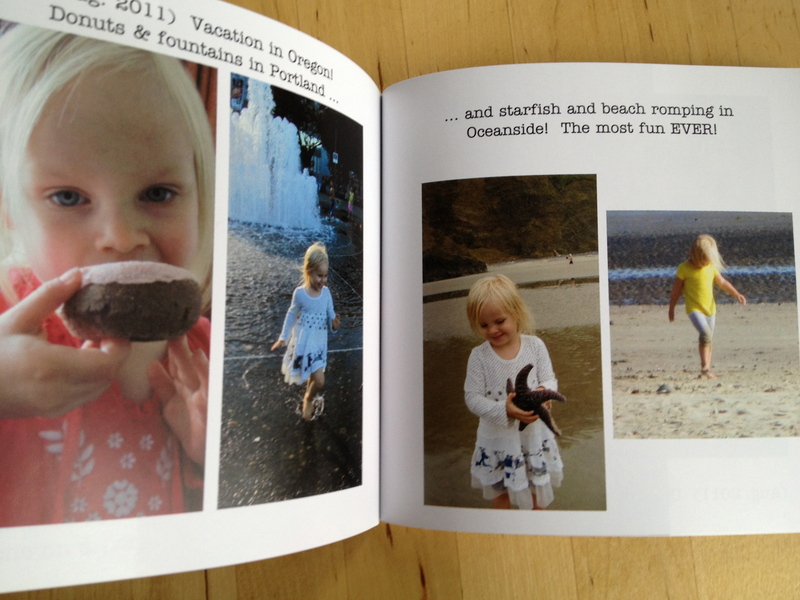 It’s kind of like doing paper-mache and kids do that, so I should be able to do this, right? 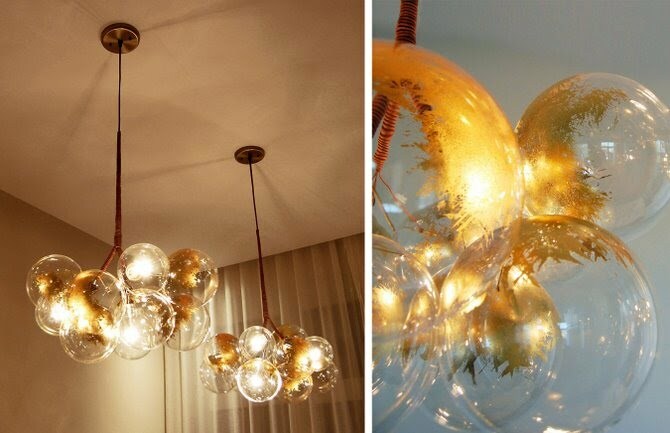 These DIY Bubble Chandeliers have been popping up everywhere. I like this gold version from Jean Pelle. 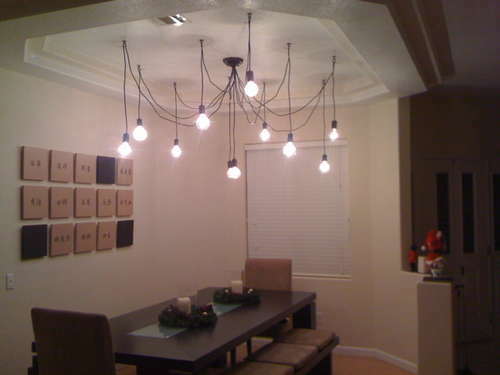 The picture above is of Pottery Barn’s Edison Chandelier and there is a similar DIY version hack on Instructables using Hemma lights from Ikea. . It doesn’t look like a beginner project, but it could save you $300. 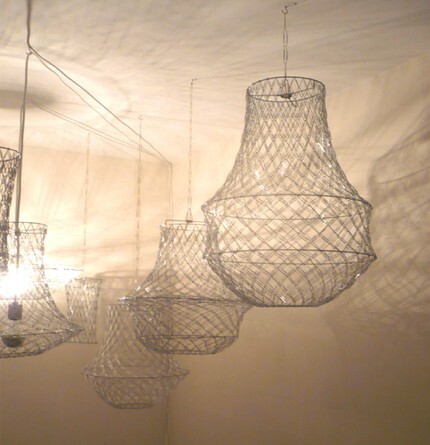 These Paperclip [yes paperclip] Chandeliers are from Resdesign Technologies. You can purchase one custom made, get a downloadable PDF tutorial, or a semi-assembled kit. 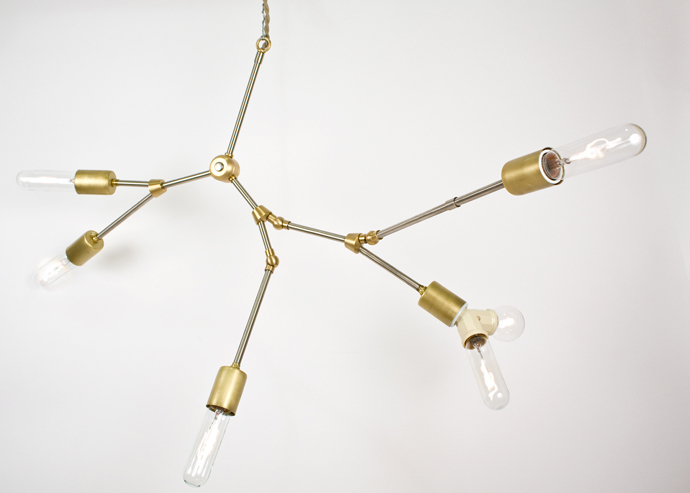 This unique piece from Lindsey Adleman Studio is highly customizable. 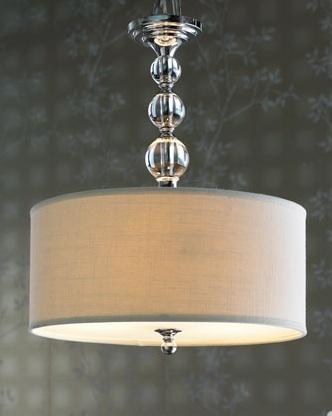 She also has some bubble chandelier options on her blog. 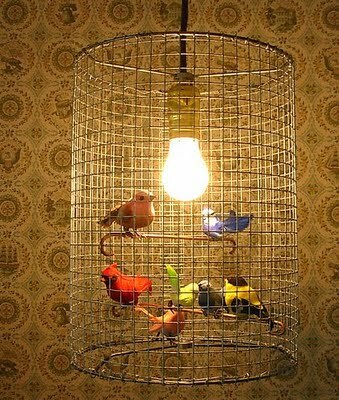 This Birdcage Chandelier [via Kitschy Galore] doesn’t come with a tutorial, but looks pretty easy to make. I’ve sent her a message to see if I can get the DIY from her and if I do, I will post it! The detailed tutorial for this Horchow drum shade knock-off [original on the right] can be found on A Penny Saved.